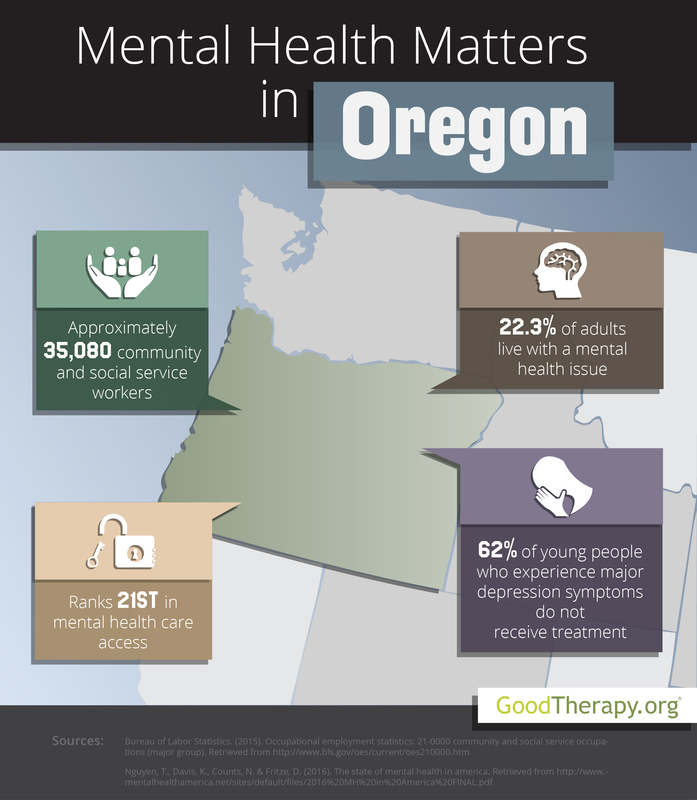 Find a therapist in Oregon with GoodTherapy.org. Oregon was home to just over 4 million people in 2015. Census data suggests 87.6% of Oregon residents are white, 2.1% are black, 4.4% are Asian, and 1.8% are American Indian or Alaskan Native. Minors make up 21.4% of the population, while elderly people (65 years or older) make up 16.4%. Approximately 50.5% of all residents are female. Approximately 35,080 people worked in health care, social service, and community assistance fields in 2015. Occupations within this group include working as a child psychologist, clinical social worker, community health worker, counselor at a residential treatment facility, or marriage and family therapist. In Oregon, residents who were employed in these and related jobs earned an average salary of $45,040. Each year, an investigation into the mental health conditions and practices of all U.S. states and the District of Columbia is conducted by Mental Health America (MHA). In the 2016 MHA report, Oregon received an overall mental health rank of 51st, the lowest placement on the list. Researchers from Mental Health America posit Oregon’s low overall rank is associated with factors such as low rates of graduation, low rates of graduation for people with disabilities, high rates of child maltreatment, and high rates of homelessness in the state. In other major mental health measures, Oregon finished 48th in adult ranking, 49th in youth ranking, 51st in prevalence of substance dependence and mental health issues, and 21st in access to mental health services. An estimated 22.3% of the adult population in Oregon experiences mental health issues—the highest percentage in the country. According to the 2016 MHA survey, substance dependence and suicidal ideation among adult residents are major concerns for local therapists In Oregon, 9.5% of all adults abuse or are dependent on illicit drugs or alcohol, while 4.4% have suicide thoughts. The state was ranked 37th and 45th in these respective measures. The prevalence of depression and substance abuse issues among younger residents is also high. Oregon placed 51st for young people with at least one major depressive episode in the past year; 51st for young people with severe depression symptoms; and 44th for young people who abuse or depend on drugs or alcohol. While it is reported that Oregon has a high prevalence of mental and behavioral issues, the state was ranked 8th for mental health workforce availability. In the 2016 MHA survey, Oregon had the 13th-lowest percentage of adults with mental health issues who did not receive treatment and the 9th-lowest percentage of children who have private insurance without mental health coverage.